Ph: Me, keeping it basic, in the high waist wide cropped jean. Photographed by Becky Erris. I love nothing more than wearing a super simple outfit, say black pants and a white shirt and then adding statement jewelry to take the outfit up a notch. It's so easy and definitely something that I started doing since I moved to New York, 10years ago (eek!! can't believe its been that long!). Check out my edit, (at a variety of price points), inspired by the above backstage shot from, the always inspiring, JW Anderson f/w 2017 show, at London Fashion Week. Monday morning, you're standing in front of your closet and your mind is totally blank with what to wear. You're tired and the coffee has yet to kick in. If only there were a fashionable yet super simple uniform that you could just slip on, eliminating the worry whether you are dressed appropriately and freeing up your time to tend to your kids or (in my dreams) lie in bed for an extra 30 mins. Well New York Fashion Week came to our rescue this season! Known to be the more wearable of fashion weeks it truly delivered on that promise. Multiple designers for fall/winter 2017, sent down their runways an outfit combo that almost every woman already owns in their wardrobe!!! : A white shirt paired with black trousers. Isn't that the best news ever? 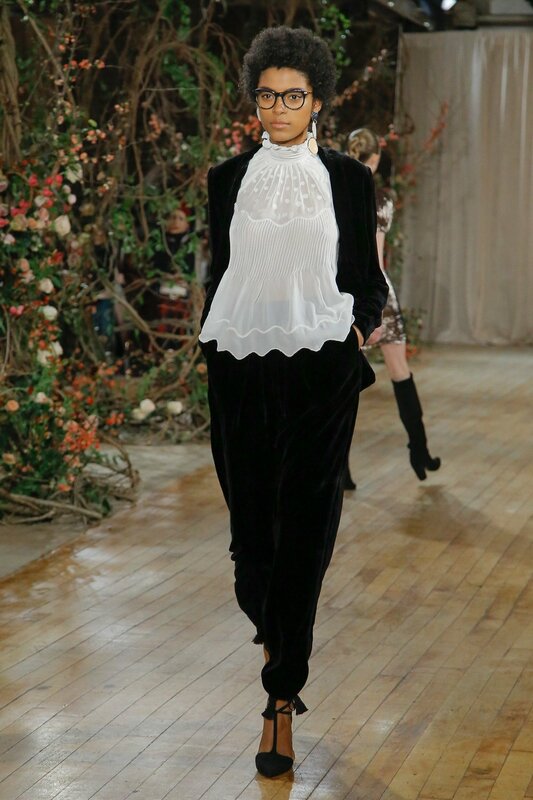 Each designer obviously gave each shirt their own beautiful twist by experimenting with proportions for new incarnations; Monse gave their's sculptural ruffled sleeves paired with slim pants, The Row made theirs more masculine and Ulla Johnson added a vintage blouse with velvet tapered trousers. But regardless of which shape appeals to you, the message was clear, keep it simple, chic and most of all wearable. New York Fashion Week FW2017 is upon us and in typical Fashion week style it's snowy, rainy and freezing but the show must go on! Cold ankles, nobody wants them, but it's the age old problem of what to wear on your feet with a midi dress in winter. Fear no more! Ulla Johnson has solved everything by simply pairing a pair of knee high boots with said dress. I'm loving the slouchiness of the boots and the wonderful autumnal colours but also check out how she pairs a floral dress with basic black. Ryan Roche's collection is always so delicious and her neutral palette so dreamy. My favourite takeaway was the easy to wear tailored trousers paired with a ribbed sweater in a tonal palette: Think blush, creams, greys and even black. 3. Denim on Denim: I have mentioned multiple times how much I love a Canadian tuxedo and clearly so does Raf Simons, Calvin Klein's new Creative Director. What I love about this look is how tailored the denim looks and the layered turtleneck. SO COOL! 4. Fun with Jeans: My good friends' mum always uses the phrase "ooh fun with jeans" which I think is the perfect way to describe that perfect top that's going to fit neatly into your life (and obviously with your jeans). Jonathan SImkhai's recent and successful dive into denim doesn't disappoint and neither does his fun with jeans blouse! This morning, in the gardens of Paris' Rodin Museum saw a fairy tale of mystique and romance with Maria Grazia Chiuri's first Haute Couture collection for Christian Dior. A surprising contrast to her spring/summer 2017 collection where "We should all be Femininsts" became the focused take away. Today she could not have been more feminine or sensitive, but it can be said that showing vulnerability is a strength in itself non? Surrounded by walls covered in fragrant foliage, the girls floated (in satin and lace bowed ballet slippers) through this magical wonderland wearing dramatic dresses of layered tulle and embroidery- think soft dreamy pinks, peaches and whites, midnight blues and blacks, and (my favourite) green with 3D florals. Adorning their heads and faces they wore floral or feathered masks and head dresses – worthy of a grand ball. The makeup created and styled by Peter Philips, Creative and Image maker for Christian Dior Make-up, saw girls with minimal makeup, (no eyeshadow or mascara!) but skin with a "luminous glow” created to “ bring out the play on the starry glitter,” that Phillips personalised for each girl. In one look, the glitter was applied in a "Stardust" shower on the cheekbones swept up towards the temples. Those looking for true escapism apply here.